When weeks of hasty dinner prep leave your stovetop in a state, never fear: A combination of common pantry items can restore the shine to your appliance and a sense of order to your kitchen. On those busy nights when you’re lucky to have found just 20 minutes to put toward preparing a one-pot meal, cleanup seems like it can wait. Regret only sets in days or a week later, when you’re bent over, scrubbing away splatters of caked-on grease or drippings. 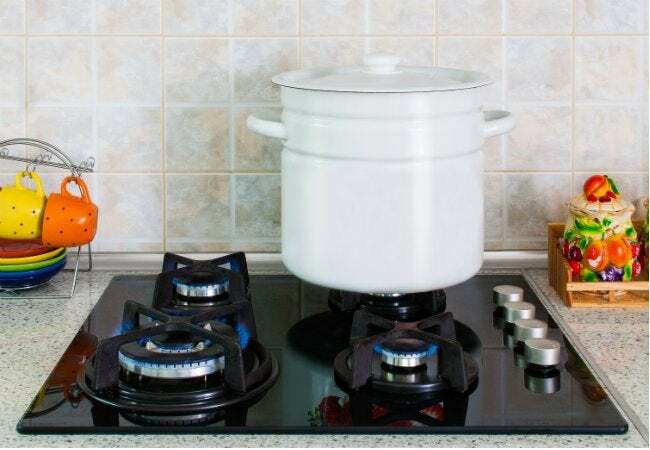 No matter your homekeeping style—whether you prefer to do a little bit every day or a giant deep-clean once in a blue moon—these tips can help you clean a stovetop effectively, and without going nuts in the process. 1. Take off removable parts. These include such things as the grates over gas burners or the coils on some, not all, electric stoves. If the control knobs on your appliance come off, remove and deposit them—along with the grates or coils—in a bucket or sink filled with hot, soapy water. If your knobs don’t budge, clean them in place with a soapy sponge. (Though people often praise ammonia for its grease-cutting, its use here runs the risk of erasing the knobs’ markings.) Towel away any soap suds left on the knobs, then dry them off before being sure to double-check that all the knobs are set to the off position—safety first! 2. Address caked-on spills. 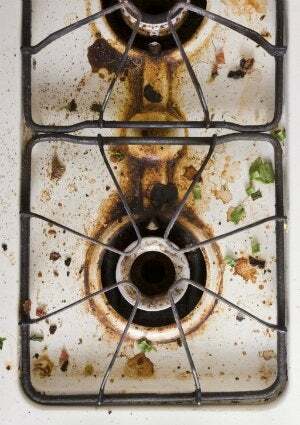 You can always use a store-bought cleaner that’s been formulated for use on stovetops. But if you’d rather not spend the money—or hesitate to expose yourself to toxic chemicals—you can brew a potent cleaning solution from natural items you likely already have in your pantry. Try this: Mix equal parts water, baking soda, and salt to create a mild abrasive paste. Apply the paste to any splotches on the stovetop, then wait a few minutes. The paste should work to soften even the most stubborn stains. Finish by firmly rubbing the dirty areas with a sponge or a microfiber cloth. Once clean, buff the stovetop dry. 3. Revisit removable parts. In Step 1, you probably left several components to soak in soapy water. Now go back to those, and you should find their grime has loosened up. Scrub each piece with a sponge—or with a stiff-bristled brush—until clean. Rinse off, dry, and replace the parts where they belong on the stove. – If you own a gas stove and have noticed that one of the burners no longer performs as it once did, the problem may be a clogged fuel port. With the grates off, take a closer look, using a flashlight if necessary. If you spot a blockage, use a bent paper clip to gently dislodge the offending debris. Now that your stovetop sparkles, the trick is to maintain its state of cleanliness. The best way to do so is by wiping down the grates/coils and the surface of the appliance after every use. Add stovetop clean-up to your post-dinner routine, if you can. Spending two minutes a day ultimately takes less time than periodic deep-cleaning—and the former definitely involves less hassle and labor than the latter.